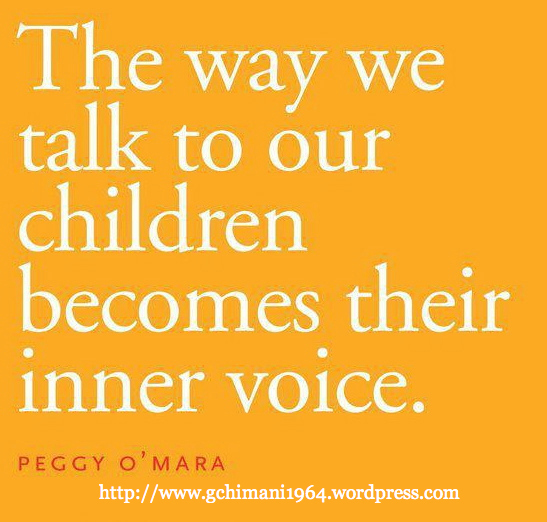 “The way we talk to our children becomes their inner voice. ~ Peggy O’Mara | Gurly's collection of quotes, notes & video's made by great people who have been sharing their enlightenment through their words and actions. This entry was posted in Love, Quotes, Self development and tagged Inner voice, Peggy O'Mara, Quotes by Gurly Hafsmoe. Bookmark the permalink. I adore this. It is such an eye-opening truth. I just had to share your link on twitter and my fb page! I cried when I read this. I don’t think I have ever felt words be so poignantly truthful. Thank you for this quote and the insight behind it. I want to change this about myself.. I HATE that i have a mean tone to my words. It’s something that has been with me since I was a child. And it’s taking a toll on my 6 year old daughter, not to mention my 3 younger children. I’m using your quote as a daily reminder to be better, to stop myself from sounding so bad…. Talk to your inner child first before reacting, How would you like to be spoken to at that age. I am learning to do this as well. Re-acting is huge. breath, walk away think, pray meditate for the right words. It works. Be patient with yourself! I need this on a poster & t-shirt for school! Peggy’s quote resonates deeply within my soul…..this is so TRUE…my sons have a clear inner voice and are strong individuals because of our love & parenting….